In the fall of 2015, arts attorney and arts advocate Dan Ellison of Durham, NC, attended a training class for audio describers taught by Arts Access of Raleigh. His interest in blindness stemmed from the fact that his mother developed glaucoma over thirty years ago, and he was already a big proponent of the arts by personal interest and profession. The class stimulated him to figure out what he could do with his new-found knowledge, and the answer came in integrating it into his part-time job as a professor at Duke University where he teaches a Service Learning Class offered by the Department of Theater Studies. 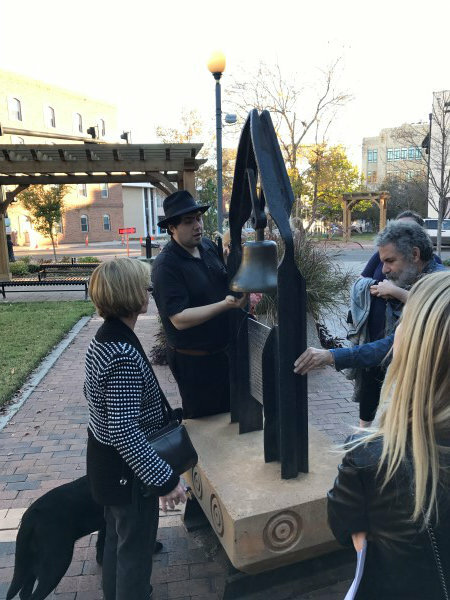 Ellison had a vision of creating audio description for public art on display in downtown Durham. Other possibilities for description included local museums, such as Duke’s own Nasher Museum of Art. He called upon Arts Access for assistance, and he obtained grant funding to hire two local audio describers as consultants. Fred Brack (who is also the ADP Webmaster) and Debbie Hippler (who taught the description class), attended several of Ellison’s classes and taught the basics of description to the students. Instead of the typical focus on description of live theatre or movies, however, they focused on description of artwork. Shortly thereafter they moved on to the Nasher Museum, where students worked in teams to write descriptions of paintings or other artworks, read aloud to their fellow classmates, and critiqued by the two consultants and their spouses, both of whom are blind. Separately, other blind individuals critiqued their work. Judge Craig Brown, blind for the last 20 years, commented that he hadn't been to an art museum for all those 20 years, because it had nothing for him to experience. He is enthusiastic about what audio description of artwork will provide for him and other people who are blind. The students then traveled to downtown Durham where they were assigned in teams of two to nine statues. The drafts of their description were critiqued and marked up by their professor and the consultants, and final drafts were recorded and placed on a telephone access system. In the future, Ellison hopes to make the descriptions available via a smartphone app and a website, with signage available at each statue. For now, you can dial in yourself to hear the descriptions at 919-694-DADA (3232). After listening to the intro, press 2 for an index of statues, then a number from 101 to 109, and finally 1 to hear the descriptions as read by the students. 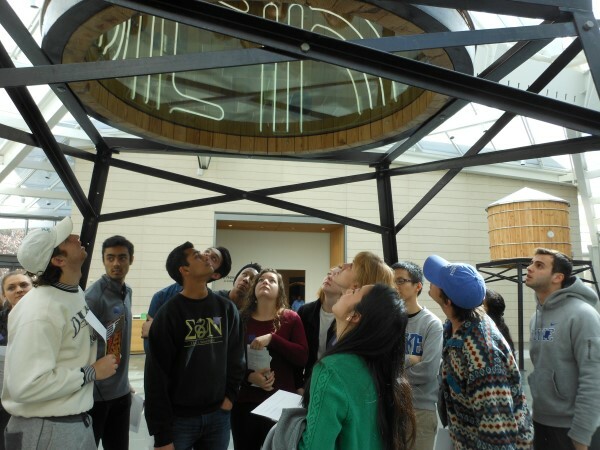 Each Spring semester, students in the Service Learning class will create audio descriptions of additional works of public art and architecture to be added to DADA, including works on the Duke Campus and at the Nasher Museum. The DADA project is a collaborative effort of Duke University, the City of Durham's Cultural Advisory Board, Durham Arts Place, Durham Arts Council, and Arts Access, Inc. Within Duke, the collaborations include: Department of Theater Studies, Department of Public Policy, the Service-Learning Program, the Innovation & Entrepreneurship Program, Office of Durham and Regional Affairs, The Nasher Museum of Art, the Office of the Vice-Provost for the Arts, and the Office of Disability Management. Giving the Blind a Way to ‘See’ Art (WUNC).